Product #45962 | SKU E35UEBK | 0.0 (no ratings yet) Thanks for your rating! 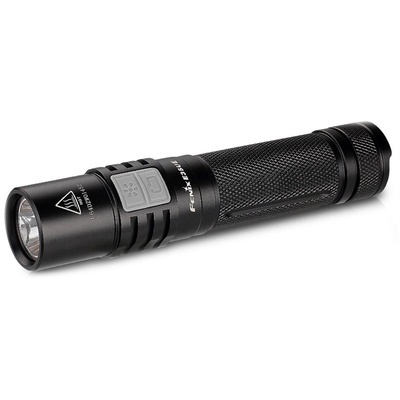 With a maximum output of 1,000 lumens, five brightness levels, and strobe & SOS functions all powered by one battery, the E35UE LED Flashlight (2016) from Fenix is a powerful and versatile light with a highly compact profile. Less than 13 cm long, it's also waterproof, durable and easy to operate. Running on one 18650 battery (or two CR123s), the E35UE is housed in type III anodised aluminium and is fitted with a toughened glass lens with anti-reflective coating. On/off, mode selection and cycling through brightness settings is accomplished with easy-to-reach dual side switches. The output is digitally regulated to remain consistent over the battery's lifespan, and there's a lockout feature to prevent it from being turned on accidentally. O-ring sealed and IPX8-rated, this light is submersible to 2.0 m. It has built-in overhead and reverse polarity protections, and its knurled surface provides a sure grip. It can stand up flat on its tailcap to serve as a candle.